Scotland has a wide array of open spaces and rolling hills, perfect for thousands of music fans to descend on throughout the three sunny months of the year the UK is graced with. For years T in the Park was flying the flag for mainstream Scottish music festivals, however after coming to a sad end in 2017, Scotland’s festival line-up wasn’t looking too strong. Since then a wave of summer music events has popped up in and around Glasgow and Edinburgh, and music fans rejoice once more. Check out our line-up of go to Scottish summer music events. If you want all of 2019’s best artists in one place, over one weekend, then look no further than Glasgow’s TRNSMT festival. Located a handy 15-minute walk from both Glasgow Central and Queen Street Station, this festival is an absolute stone’s throw from civilisation. This no-camping, inner-city festival is a three-day event with a blinding line up of 2019’s most popular musicians. It’s main stage line-up features Brit nominees and chart toppers, and the smaller stage (sponsored by Glasgow venue King Tut’s) has a simultaneous more independent line up. The close proximity of the stages means you can flit between each one throughout your three day stay. Like any good festival, a wide array of streetfood vendors will be dotted across the Green, and the festival is sponsored by Carlsberg, Somersby and Smirnoff, so we’re pretty sure there’ll be plenty to drink. Don’t want the party to stop? Your proximity to the city centre means you can be in a club within half an hour of the music ending for the day, and you can get back to a comfy hotel bed and ensure you’re fresh enough for the next day. Go to see: Stormzy, Catfish and the Bottlemen, George Ezra, Gerry Cinnamon, Bastille, Snow Patrol, Years & Years, Richard Ashcroft, Jess Glynne, Example, The Hunna, Circa Waves. If TRNSMT is the party festival, Summer Sessions is its mature older sibling. If you want to catch amazing, award-winning acts (and some super supports as an added bonus) whilst nursing a beer and sitting in the sun, then Summer Series is the one you want. Located at Bellahouston Park and Prince Street Gardens, the festivals in Glasgow and Edinburgh offer you a city-centre location and one a bit further out. To access Bellaouston Park from central Glasgow you can use one of the festival’s regular shuttle buses. From chart topping Lewis Capaldi to lad rock Courteeners and dad rock James, this selection of summer gigs has it all. 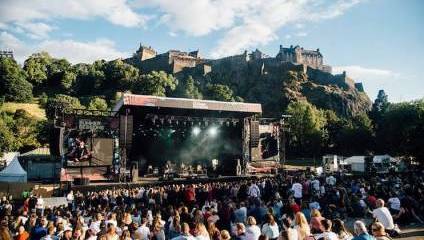 The Edinburgh concerts have yet to announce their support acts, however the Glasgow shows have each announced between three and six supports, featuring big names like Slaves, Twin Atlantic and You Me At Six. Go to see: Florence + the Machine, Primal Scream, Chvrches, Lewis Capaldi, James, Courteeners, Madness, The Cure, Foo Fighters, The 1975. An exciting family weekend away, Party at the Palace is a cute festival for all-ages at Linlithgow Palace. A handy half hour from both Glasgow and Edinburgh, the festival takes place in the grounds of the historic palace and overlooking the length of the loch. Spread over the weekend the line-up includes a wide variety of old acts and new, DJs, cover bands and local acts. Fairground rides and street food vendors a-plenty, there’s much to do in-between acts. Whilst the festival is no-camping, it does recommend the local Loch House Caravan Park and Belle Hotel for a glamping experience. With regular public transport links, a weekend at Linlithgow Palace will be an excellent summer-mini break without the commitment of a full weekend camping. Go to see: The Charlatans, KT Tunstall, Midgeure, Definitley Oasis, Deacon Blue, Wet Wet Wet, Fun Lovin’ Criminals, Rge Craig Charles Funk & Soul Club. Ready for the full festival experience? Camping, glamping, real ale and dancing till dawn is on offer on the beautiful grounds of Drumlanrig Castle. Luscious Scottish countryside is flooded with people with music on the mind. Suitable for families, the festival has plenty of stuff for kids to do, including an adventure playground, magic shows, art and drama workshops, and even a zoo experience. Kids (and drunk adults) will be extremely excited by the on-site funfair, and the comedy and cabaret tent are the perfect chill out spot for in-between bands. Four stages mean that there’ll be no shortage of music throughout the three days, and there is still so much more yet to be announced. Finally, best news of all is the price of this ticket. £130 for an adult’s weekend ticket and £22-£55 for kids aged 6-15 (5 and under go free). Compared to mainstream English festivals this ticket price is an absolute steal. Go to see: Metronomy, The Vaccines, Frank Turner & The Sleeping Souls, Friendly Fires, Sleaford Mods, Fat White Family, The Futureheads, Iceage.